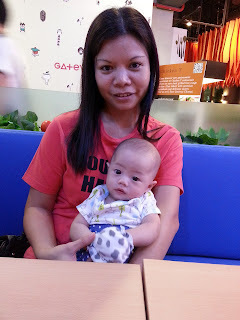 So Friday evening, yesterday, Hobbit and I took little Hobb to the newly opened Japanese Mall, Gateway to get some 'fresh air' (you know Bangkok!!). Little Hobb also got to meet aunty Jov, who came for vacation purposes. We dined at a Japanese restaurant called Otumo Tomato. The food was great and I will surely be back for their ceasar salad and pumpkin soup! I love the colors of the restaurant too, I mean, at least little Hobb did, for a while. I just wish they have oversized bean bag chairs where we can sit on and relax. The night was good. Little Hobb enjoyed his stroll and we got to chill after a long day of work!